Because this adventure is non-linear, this walkthrough follows only one of the many possible sequences of gameplay. You may want to try reading only the section you are stuck in. If possible, read only one line of text at a time to avoid revealing the next line and possibly a clue. Enjoy! You find yourself inside a dark room, carrying only a small piece of paper with strange markings on it. How did I get here? What does this paper mean and how did I get it. Was someone trying to help me? Perhaps the book on the table will provide some answers? After reading the book, you try opening the door, but it's locked. You move around the room and find another door. It's not locked and It's the way out! The shop is filled with hundreds of items for sale, however, only the Cabinet seems to contain anything that might be of value to you. Potions, scrolls, elixirs, herbs... interesting, but what exactly do I need? Doesn't seem like stuff I should fool around with. Better check this out later. Move to the Board of Blood Stones on the left side of the shop (on the table, under the large cage). Click on the right side of the table to hear directions on how to play the blood stone game. Swap two-conjoining stones to create a row of three or more. "The more stones in a row, the more blood will start to flow" Some stone-types provide more blood than others - Try to figure out which ones increase the most blood. Blood will gradually decrease in vial - so try not to take too long. Once the vial is full a vision will appear in the center of the board... A skull appears with two different colored eyes - purple right eye and a red left eye - "The secret lies within the eyes" What does that mean? Perhaps I will find out later? to find the fruit is in it's spot." A few clicks on the button, reveals it must be broken. Perhaps this is the machine the note on the wall was referring to? Not sure...Can't find a model number. Maybe you can fix it? Better take a look inside. The ic-board contains 12 clock Mhz circuits with tiny numbers displayed next to each. The lower-right circuit displays an "ERR" flashing in its display window. The note on wall mentioned something about lightning changing the clock processor's speed (and there sure has been plenty of lightning tonight) so perhaps it just needs a few adjustments to get it working. But what could the correct settings be? The circuit pattern looks familar... It has the same arrangement as the piece of paper you're carrying doesn't it? Notice the roman numerals on the paper match the numeric numbers on the ic-board. - Adjust the processor clocks according to the tiny numbers on the piece of paper found inside game package. Once adjusted correctly the "ERR" will change to the text "SET"
- Click on the card-drop box in lower part of machine to read card - "You will get a HAND in opening a locked door" - Strange fortune - but ok, you can probably use all the hands you can get, right? Squeeze through the Front Gate to the Porch and then enter the mansion Foyer. - Move "back" from the desk top. - Click on the Desk Drawers to open them. Open the second drawer and take the light bulb. Open the third drawer for the magnifying glass and open the bottom drawer for the fuse. - Examine the strange ornament on the top of the bookcase. It appears it could be a button. Press it to reveal a secret passage behind the large painting on the opposite side of room. A push strong push on the door and you know this ain't moving. There is a open metal box to the right. Click on it to examine closer. The front faceplate of this electronic panel has been removed or destroyed. The circuit board appears to be ok, with no cracks or damage to the components. Perhaps it's only a fuse that has blown? That would be an easy fix. But where's the junction box to this section of the house? - Click on FAR RIGHT side of screen to move "back"
Get ready... the ghost of Mira tends to appear in sequence with a flash of lightning from outside and then leaves just as mysteriously. Listen carefully and learn the story of why she brought you here. Feel free to click on the dialog choices at bottom of screen to hear more. A careful look on the center cooking counter reveals a small sharp knife. Take it. Feel free to use the phone here if you want a freakish ear worm to appear from inside the phone. Why? Is it Jaja's spirit? Completely shrouded in shadows, it is difficult to see much in here. It would be nice to turn on the light, but it's so dark you can't even find the switch. It's got to be around here somewhere. You can see the bulb in the center of the room, so you know there must be switch. Aren't light switches are usually near the doorway. Better feel around in the dark. - Turn on light... Bam! I guess that bulb wasn't good, huh? - Replace bulb with new one found in desk drawer in study. - Turn on light again. Thats better. You can see now. - Exit pantry and move out of kitchen and back into dining room again. Exit through doors on left side of dining room onto balcony. Immediately outside of the dining room doorway, you will find yourself on the balcony. Move into the backyard and then move to the east yard. Move to side of house and then to the shed. This room is mostly empty, except for a few boxes and a couple of shelves. A doorway in the back of this room is all bricked and boarded up. Is there a room behind those bricks? Can you break it down? - Notice the wrench on top of the barrel? Take it. - Use the sledge hammer to break down the boards and bricks. A lamp from the storage room casts dusty beams of light on an old antique generator in the corner of this room. On the left wall contains a power-junction box. Perhaps it will open? Try it. - Place the fuse into the empty slot. Now to get the old generator working...Click on it to take a closer look. - The lever is stuck. Do you have something that could move it? Try the wrench you found. - Exit storage room and return to house. Enter the study and then the passage. Now that you have turned on the generator and replaced the fuse you can notice the blinking red L.E.D. at the top of the circuit board. But since its red it must not be activated correctly. Normally the missing faceplate would provide the input to open the door. Better figure out a way to bypass. There are a few wires here. Can you figure out where they go? The wires seem to be very stiff and are not flexible at all. Perhaps if you line them up with possible circuits leads, you could figure out the only logical place they could fit? - Using the mouse, drag all the wires onto the correct leads. Release the mouse button to place wire in spot. You will notice that the wires will click into place if you are near the correct area. Trial and error usually works here. 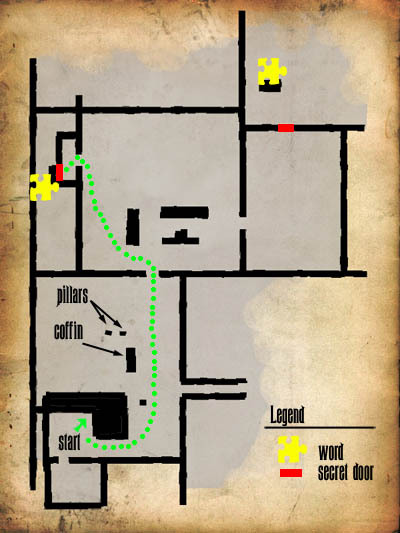 However, there is a diagram on the last page of the Doctor's journal (located in basement furnace - of course getting down there is a completely different puzzle) - Click HERE to view the completed puzzle. 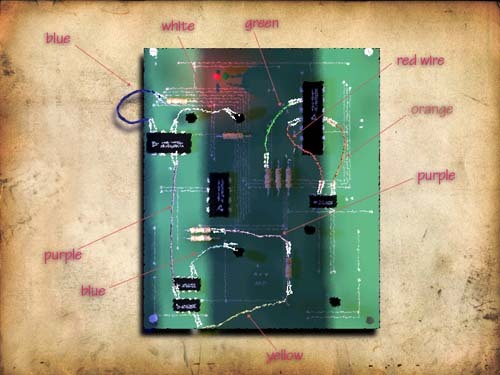 - Another hint for the wire puzzle is... don't bother trying to overlap any other "correctly placed" wires or circuitry. Everything fits very clean and neat when finished. - When all wires are placed correctly you will hear a small buzz and the lab door will open. Once inside the lab, move to the operating table and take the syringe then check out the computer. It might have some important information left by the doctor, huh? But of course she password protected it! That torn piece of paper you put together upstairs could have something to do with this. - "Five touches of the keys" - a computer keyboard has keys, huh? - "Electronic solution that you crave" - a computer is electronic huh? - "Mirror image of the grave - why is the word grave underlined? Maybe it has something to do with the word "grave"
Figure it out yet? Nope? - You might want to write down what you find in the two folders - You will need it later. Move closer to the dresser with mirror and open the bottom drawer to find a small box of ashes. Take the box. Again you are overwhelmed with a vision from the past. Who is the little boy? Is he part of this darkness? Or was he too, summoned to help? - Don't bother examining the box of ashes. It contains no latch or door. There is no obvious way to open it. From this distance, its hard to see, but it appears the piano bench could open. Try it. Yes! Take the sheet of music and use it on the piano to play the tune written by Mira. A ghost appears at the piano and then warns you never to play that tune. Apparently it stirs the darkness. She disappears and asks you to meet her upstairs - but wait until later. For now, examine the chess board. - Notice the compartment used to store the playing pieces? - Open the compartment and read the poem, glued to the drawer bottom. - If you don't have a good memory you might want to write that down. This room is filled with plants, trees and a broken fountain. There is one particular plant that looks rather dry. Its soil is hard and needs watering badly. Perhaps you could find something to water it with? As you leave the green room... A creature, hiding in the shadows, quickly runs towards you. You drop the doll in your haste but manage to escape. "Ashes to Ashes... Dust to Dust!" - The box of ashes? How does he know I have it? Who is he? This entire room is filled with cages. You notice a few open and examine one in particular, in the middle shelf to the right. A closer look reveals a tiny hair in the bottom of the cage. Perhaps you could use this, like the file on the computer in the lab stated? Better not contaminate it though. - Move left and check out the other row of cages on shelves. Is that a shovel underneath the left shelf? Take it. Though, there are many graves surrounding this estate, you can feel a sense of overwhelming darkness on one grave in particular. Perhaps this grave should be dug up? - Enter grave and take the ring. - RIGHT-CLICK on ring to examine it closer. Interesting! It moves when the symbols are clicked on. Enter the house and talk with the lady in the rocking chair. She will tell you what she knows of this dark story and the doctor. Perhaps she could help you? Maybe she could give you a suggestion on how to open that box. - Give box of ashes to the lady. Then listen to her suggestion. Does it make sense? - Take a look at the book on the right side of room. Something about the "Heart of Darkness"
- Cut open apple with knife and examine to find the bloody beating heart of a crow, as mentioned in the book. It would appear this piece of the puzzle has been done for you. Is someone helping you? Use the key you just found on the old chest. There's something inside. A staff of sorts. Take it and examine it. It looks familiar doesn't it. Remember Mira's journal you took from the hallway table earlier? The second page contained some symbols that look like the ones on the staff. You wonder if... yes... sections of the staff rotate. - Click on the sections to align the staff combination according to Mira's notes in the journal. - Leave the attic and return to the upstairs hallway. - Examine the chair. You have found the doll once again, however, now it is broken. Secret inside the doll? More roaches? Examine the doll closely. Take the key. With only the light from the bedroom above this room is extremely dark, making it difficult to see much of anything. You can hear the faint sounds of a rodent near. Perhaps you catch it? But how? Where is it? - Examine the hole in the wall, near the left side of room, to find a few rat droppings on the floor. - Place the cheese on the mousetrap first, then place the mousetrap near the hole on the left side of room. ...there's a partially hidden painting behind the container. Take the painting and examine it. While examining it, click on the painting to turn it around. It looks like there might be something written in the lower left corner. It's too small to read. Perhaps you have something you view it larger? - Use the magnifying glass to see the writing, written in blood. There is a rather creepy portrait of a hideous woman here. Click on it to take a closer look. 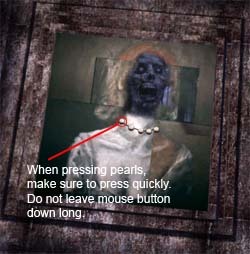 She's wearing a pearl necklace. A closer look reveals the pearls are actually buttons. This scenario sounds a little like the poem you found downstairs in the chess drawer compartment. Do you remember what it said? - Press the buttons in sequence like the poem suggests. The strange altar looks interesting and so does a small dish near the floor. Check out the dish with dead crow on it. Remember the tiny note on the back of the painting? It mentioned something about blood didn't it? Perhaps you should take some from here? - Dip paintbrush into crow's blood. - Move back from dish. Why is there an easel facing so close to the mirror in this room. Was it placed like that on purpose? Just then you remember the strange words you heard from the bloody boy in the dark alley, back in town. "Paint your dream to come alive"
GREEN - Where you are. RED - Mira's nightmare ghouls. Examine the dresser to the right, there's a small jewelry box. No key required (what a relief!) Simply open it to reveal a torn poem. Examine the poem and put it together. Do you notice anything interesting about the poem? It talks about moons, stars, hearts. Does that remind you of anything you might have in your inventory? - Examine the Ring and click the symbols in-sync with the torn poem verse. Apparently the cave ends where the foundation of the house begins as you find yourself in the mansion basement. Check out the tiny newsclipping posted to the beam. (An ancient temple? Better check that out soon) Then check out the furnace. Read the book to reveal what Mira was supposed to destroy. Go upstairs and into the pantry. Then move back into the study, down secret passage and into the lab. This is long strange spiral staircase leading down to a dark pit. The pit contains a chain-driven lift mechanism. But reading the doctor's notes, reveals she has disabled some of the gears to avoid anyone from using the lift. Something is in the pit, but you will need to re-arrange the gears in order to get it working again. Place the gears onto the pegs. Although there are a few of the same sized gears, each gear must fit on a particular peg. - The skull's mouth will open, revealing a small cylinder-shaped keyhole inside. "Eggs from the Widows buried deep inside three heads"
"Triggered by the weight of the spiders in their webs"
"A door soon opens with the guards from their nest"
"Sunken in the floor where the skulls of dead must rest"
- Place the 3 headed skull into the floor - Place the spider eggs into the 3 headed skull. A pillar with a strong force raises with a medallion on top. How are you going to get that medallion? The force is strong here. Too strong to simply take it. Can you remove the evil force which surrounds the medallion? Didn't Mira mention something about this in her journal? "Surrounded by enormous power... A mortal's touch is instant death"
"Written in the blood of ancients... Spoken once and under breath"
"Deadly words from cryptic scroll... To deafen ears of the beast"
"Unlocking medallion from its perch... to fit inside metallic feast"
Cryptic scroll? Maybe you should take a look at the scroll you found in the safe? Perhaps you can extract the necessary essence from the Jaja's hair you found in the cage. The doctor mentioned how to perform this procedure in her computer. - Use the syringe on the beaker labeled "Alcohol"
- Use syringe on beaker labeled "Embryo"
Animation will show syringe injecting embryo with Jaja's DNA. Upon entering you should be greeted with a time-lapse animation of a yellow flower growing on the once almost dead plant. (Since you watered it approx. 30 moves ago) Take the flower and move outside into the backyard and to the crypt. There are the bones of Jaja hanging here in the center of the room. You are prevented from moving closer due to a deep chasm surrounding the bones. Remember the note mira wrote about in her journal? Remember the journal in Room 204? Something about the spirits waiting for them to command them? Perhaps a word could help? Perhaps that word you read in Mira's dream? - Type in the word you read on the wall in Mira's dream - A plank slides open over the chasm, allowing access to the ritual bowl. - Remember what the swamp lady said were the necessary ingredients? Remember the sequence? Where are the crow bones? Remember the last passage in the poem that helped you open the ring? Remember the loud crow that suddenly appeared over the grave after you took the ring? Was he trying to tell you something?